Deadpool Movie is coming out so come in and start reading Deadpool comic, and Graphic Novels. 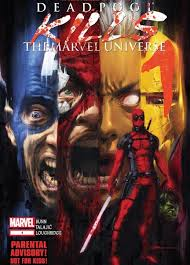 Start with the new Marvel Deadpool #1 or Deadpool Kills the Marvel Universe. Throughout January Marvel is reprinting classic Deadpool stories in single issue format for $1.00US. Available at Comic King North while supplies last.